Margaret Spellings of University of North Carolina won’t enforce HB2. 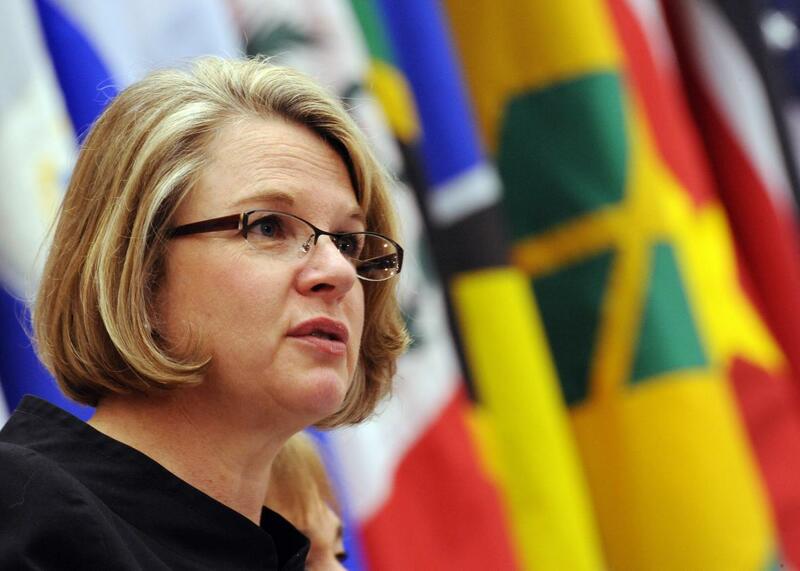 UNC President Margaret Spellings photographed in 2008 when she was secretary of education. To pull off its astonishing effort to revoke the civil rights of LGBTQ residents, the North Carolina government required a unified plan of attack. This should not have been difficult, as the GOP spent most of this decade engaging in a takeover of the state. In addition to seizing the governor’s mansion, North Carolina Republicans gained a supermajority in the legislature—then gerrymandered the state to favor their party. Conservative legislators passed stringent voter ID laws to neutralize those pesky remaining liberals—including students, whose student IDs cannot be used to vote—then meddled with the state Supreme Court to maintain its Republican majority. This united front prepared the state’s powerful Republican establishment for a relatively smooth rollout of HB2. Republican legislators easily passed the law in a single day, and Gov. Pat McCrory signed it immediately. Spellings asserted that she would enforce the statute soon after and issued guidelines to put her university system in compliance with its anti-trans provision, which bars trans people from using the bathroom that aligns with their gender identity in government buildings. Together, McCrory, Spellings, and conservative legislators seemed prepared to battle the inevitable onslaught of lawsuits together, rallying behind the law they had all chosen to support. Then, last Thursday everything fell apart. Make no mistake: This is a complete about-face, as well as a clear rebuke to HB2—and, implicitly, the politicians who passed it. With more than 260,000 students, faculty, and staff, UNC represents Ground Zero for HB2: Since the law applies to government buildings, it had the potential to turn UNC’s campuses into an anti-trans battleground, excluding trans people from bathrooms in dormitories, performance halls, class buildings, and administrative offices. Trans students feared they might have to go home to use the bathroom during class, lest they use school facilities and get arrested for trespassing. Now that risk is wiped away, granting trans UNC students at least a temporary reprieve. It’s hard to overstate the importance of this massive crack in the unified front. McCrory and the legislature needed Spellings on their side to apply, enforce, and validate the law. She now refuses to do so, effectively defecting from the party line and shattering the consensus of the state’s conservative establishment. Her apostasy telegraphs her belief—formed, it must be said, under the pressure of a lawsuit—that UNC’s own policies (which comply with federal law) must trump the state’s (which violate federal law). Without Spellings’ support, conservatives’ charade that HB2 is just a common-sense, pro-student privacy law crumbles even further: They can’t even persuade their own handpicked appointee to stand by their disastrous statute. Spellings’ sudden reversal won’t repeal HB2 on its own. But it does represent a crushing symbolic defeat for a much-maligned law that already seems to be halfway to the ash heap of history.